Um why can’t my breakfast look like this every day? It’s a freaking peanut butter parfait! And it’s a good one. This peanut butter parfait just might be my new go-to. Even though I’ve been really into savory breakfasts lately, once a week or so I need something sweet. And pretty much every day I want something peanut buttery. I looooove peanut butter. This recipe comes from my friend Lindsay’s new book, Nourishing Superfood Bowls. The whole mess is a delicious peanut butter yogurt mix and it tastes SO good. I actually keep making the yogurt mixture on its own because it’s just ridic and so so easy. Almost like whipped peanut butter yogurt mousse. But not horrible for us! Lindsay includes these fun cookie dough balls too! They are a mix of oats and honey and crumble right into the yogurt like a dream. Her version uses protein powder but since I ended my affair with that years ago (I’m basically scarred), I used the plain collagen peptides and they worked great! And I loved making these into little parfaits because they seemed like a dessert! Or breakfast dessert. Like the treat that you want to eat AFTER breakfast. They are topped with molasses (get the really good stuff) and toasted coconut too. Texture, crunchy, creaminess… I can’t. The combination is just so perfect. Lindsay’s book includes SO many amazing bowls. Like it makes me want to eat veggies everyday for every meal – it’s all so fabulous. But there is also a small chapter in the back filled with amazing treats, and this is one of them. A pinch of sea salt on top? I mean, I’m dying! This is like eating a big peanut butter cookie for breakfast and I don’t hate it. Place the oats in a food processor and pulse until they are finely ground. Place them in a mixing bowl and add in the almond flour, protein powder or peptides, cinnamon and peanut butter. Mix well to combine. Add the honey and vanilla extract, mixing well. Being to bring the mixture together with your hands and roll it into 1-inch balls. Place them on a parchment sheet lined baking sheet. Freeze for about 30 minutes until they are set. They can be stored in a ziplock bag here until ready to use! Whisk together the yogurt, peanut butter and honey until smooth. You can transfer the mixture to bowls or make these cute little parfaits like I did! Later the yogurt mixture with some of the crumbled cookie dough bites. Drizzle with the molasses and top with the toasted coconut and sea salt. Serve immediately. recipe from Lindsay’s new book, Nourishing Superfood Bowls. The vessels you used are super cute as well. May I ask where you purchased them? For the cookie dough bites, the amount for the almond or peanut flour is missing. 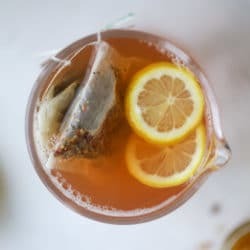 Need to make these bites! Hey Jess – in the recipe it says “1/2 almond or peanut flour” 1/2 tablespoon, half cup?? Looks amazing!! I love peanut butter ice cream so I’ll try this this weekend. Thanks! I’m with you on savory breakfasts but this looks ahh-mazing, and possibly like a fantastic dessert! You and Lindsay are two of my original blog friends. Love this parfait! I vote for making breakfast look this pretty everyday, for sure. I need to know the calories and nutrition info before I can indulge in this most delicious and spectacular sounding “breakfast”. Please! My mouth won’t stop watering. Hey Phyllis, feel free to email me for the calories. I have the breakdown of the yogurt and bites separate. Just depends on the protein powder or collagen you use. This parfait is so perfect!! I’d been making them with yogurt, peanut butter and honey but just recently figured out to stir that all up really well before topping with sliced apples and Cheerios usually. Game changer! I must make these cookie dough bites now too! This totally works with sunflower seed butter if you want the peanut free version. 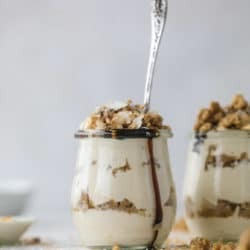 I love peanut butter and this parfait looks absolutely delicious and perfect for hosting! I think I’ve died and gone to heaven. I can have my breakfast and dessert too. Oh, it’s simply too good to be true!! What’s good molasses and where do you find it? i’m soooo with you on the PB. like, not a day goes by i don’t have at least a serving or 2…or more. this looks bomb! also makes me want to by her book. Made these today..SO GOOD! Perfect for my mid-morning snack! Thanks for sharing, it looks so yummy. I really enjoy a good parfait for breakfast and the addition of peanut butter is even better.